Mull was created as we see it today after one of the biggest bangs in history. The explosion, and subsequent erosion by glaciers, formed the magnificent Glen More. Mull has been inhabited since around 6000 BC. Bronze Age inhabitants built menhirs, brochs and a stone circle. In the 14th century Mull became part of the Lordship of the Isles. After the collapse of the Lordship in 1493 the island was taken over by the clan MacLean, and in 1681 by the clan Campbell. In 1588 one of the ships of the Spanish Armada, Florenica, was moored in Tobermory Bay and blown up there, reputedly with £300,000 of gold bullion on board. During the Highland Clearances in the 18th and 19th centuries, the population fell from 10,000 to less than 4000. Mull was created as we see it today after one of the biggest bangs in history. The explosion, and subsequent erosion by glaciers, has formed the magnificent Glen More. Ben More stands on the edge of the crater and is climbed regularly by walkers completing the 'Monroes' set. Ben More is traditionally the last Monro to be climbed. Mull and its islands have been continually inhabited since they became environments able to support man after the Ice Age. C. 6500 - 3500 BC. Mesolithic hunter-gatherers lived in caves such as Livingston's cave on Ulva. C. 4000 - 2000 BC Neolithic farmers people lived here leaving behind burial cairns and stone axes. C. 2500 - 600 BC. Bronze age 'Beaker' people lived on Mull, their burial cairns, cists, standing stones, stone circles, and corded beaker pottery and knife blades record their existence. C. 600 BC - c. AD 400 Iron Age peoples built forts, brochs, duns, and crannogs, - numerous defensive settlements on these islands. The early Christian period began in the 5th Century, with 563 noted for the arrival from Ireland of St Columba. Viking times started in 795 when Iona was first sacked, raids continuing for several centuries. Vikings eventually became settlers in the isles. The Middle Ages saw the construction of castles such as Moy and Duart, and chapels such as Pennygown. The clans were, Maclean, MacLaine, MacKinnon, Macquarrie, and MacDonald. During the 17th to 19th centuries, clan chiefs and other lairds built 'big' houses, whilst the majority of islanders lived in tiny black houses in small townships, occupying shielings in the summer months. 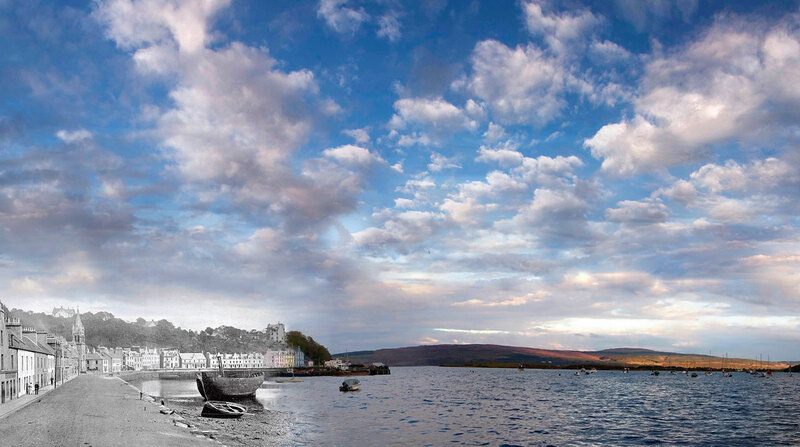 In 1788 Tobermory was built by the British Fisheries Society, as a planned settlement. Over the centuries Mull's population increased to 10,638 in 1831 but first the Potato Famine and then the Clearances rapidly reduced this number. By the 20th Century much of the population had emigrated and there were more sheep on Mull than people. Check the availability of Aros Mains Self-Catering Apartment. Check the availability of Aros Mains Dairy Cottage. Check the availability of Aros Mains Castle Cottage. Aros Mains Apartment and Castle Steadings Cottages are located at the end of a quiet road situated two miles North of the village of Salen. Our location is one of our strengths. We are placed very centrally on the island and we offer an excellent self catering base for sightseeing, touring, hill walking, bird watching and wildlife. If you are looking for directions to get to Aros Mains Apartment, Dairy and Castle Cottages whether you are Arriving from the Craignure Ferry, the Lochaline Ferry or from the Kilchoan Ferry then please go to our Find Aros Mains page for information. Fantastic break from the rat race. Excellent views and places to visit. A wonderfully welcoming apartment, ideally situated from which to explore and enjoy Mull. The flowers and scones were much appreciated! Wow, what a treat, cosy, hot water, flowers, flagstones, artworks on the walls! Wonderful accommodation, great location and fantastic hosts! We will be back for more adventures. Wonderful host, wonderful place, wonderful views - scones to die for! We had such a lovely time here, thank you Maggie and absolutely loved your hens eggs! The freshly baked scones were a very welcome treat on our return from the beach! Your kindness, hospitality and a wonderful location made for a perfectly wonderful holiday. Thank you so much for such a comfy warm and beautiful home to stay in. Wonderful! The cut flowers and tasty scones were very thoughtful and much appreciated. We'll be back! The apartment was wonderful. We truly loved the wine and scones and fresh flowers in the rooms were a lovely touch. We both felt that this was a great location for touring the north and the south of Mull. Lovely apartment and wonderful week - watched an otter from the window (with binoculars!) and very playful seals. A thoroughly enjoyable week on this beautiful island. The apartment is lovely and is very well positioned to explore. We particularly enjoyed cycling on the trails in the forests, climbing Ben More and the trip to the Treshnish Isles. Lovely week in beautiful surroundings. The apartment is a perfect base to spend a holiday. Thank you for your kind hospitality. This was a fantastic place for a family reunion! Maggie was a wonderful hostess, loved the scones and mackerel! Thanks for the extremely comfortable, warm and spacious accommodation. We have been completely at home. We have thoroughly enjoyed these lovely facilities and particularly appreciated the Wi-Fi! Thank you for the warm welcome and helping us have such a wonderful holiday. Had a great time in this wonderful cottage, 5 star service. Surrounding area wonderful as well - kids loved it. Fishing and wildlife fantastic and plenty to see and do. A Lovely cottage, a warm welcome and a great location! We've thoroughly enjoyed our first visit to Mull and hope to be back soon to see the puffins! Had a brilliant holiday on Mull. Cottage was fantastic, so clean and homely (best holiday home i have ever stayed in). Shells on beach of Aros Castle are the best the two girls have collected. Scones were superb and enjoyed them sitting out in the sun!! Cottage was lovely and comfy with great views and the chickens were always around to give us a warm welcome when we stepped outside. It was so good to come home to a cosy and welcoming cottage at the end of an autumn day - it made our holiday a great success. Very well thought out and cosy cottage with lovely surroundings which our 4 year old son really appreciated! The cottage was a fantastic base from which to explore Mull with plenty to do nearby too. Enter your email address and subscribe to our newsletter to keep you up to date with any information and special offers on the Aros Mains Apartment and Cottages. If you are looking for directions to get to Aros Mains then please go to our Find Aros Mains page for information.